Wow. Rocky's hometown. Eye of the Tiger! The Quaker City. The City of Brotherly Love (and Sisterly Affection). Early Sidebar I: Why do they call this city that? According to Dan Birchall, native English speaker, here’s the short answer: "Philadelphia" means "brotherly love." (This is, of course, why they call Philly the "City of brotherly love.") The name comes from two Greek words - phileo which means "to love" and adelphos which means "brother." Whatever you call it, it's special. Perhaps you may know by now that it's typical for me to fly around the country to attend meetings, conferences, and seances with well-known mediums in the country. Today is no different. Arriving typically late in Philly for a 3-day vacation (alright, Ron, I was working), I practically ran off the runway craving the local grub and something to wash it down. After checking into the Downtown Marriott, I did my best 100-yard dash to the Reading Terminal, home to over 30 marketeers, in under 4 minutes. I know, fast, huh?!? I powered through a Spataro's cheesesteak and sea salted fries and immediately started thinking about dinner plans. What good would dinner be without a little alcoholic appetizer?!? I was at this same conference last year and remember going to this little Irish pub next door to the hotel and trying Yards Pale Ale, a local brewery I was unfamiliar with but remember the headache to this day. It was that good. Using my co-pilot, Yelp, I found out that it was only a short 10-minute ride so I planned on making the journey after my last meeting. With a modern industrial look to the outside, I was impressed by the size, openness and accessibility to beer. Even more inviting was the warm aroma of mash that encapsulated me as I entered, the tell-tale essence of a true brewery where one could expect the freshest suds. I'm home, honey! Concerned about the impending darkness (it has been raining here for several days), I immediately bellied up and quickly scanned the lager list. First noting that most of their hopsicles were of normal potency (they ranged from 4.2% to 10.8%, averaging about 5.5%), I started to smile when I didn't see any goblet or reduced-sized sodas. My smile grew to a smirk when I saw that the Signature brews were 20-ounce pours. Let the games begin! This really is the Birthplace of America! 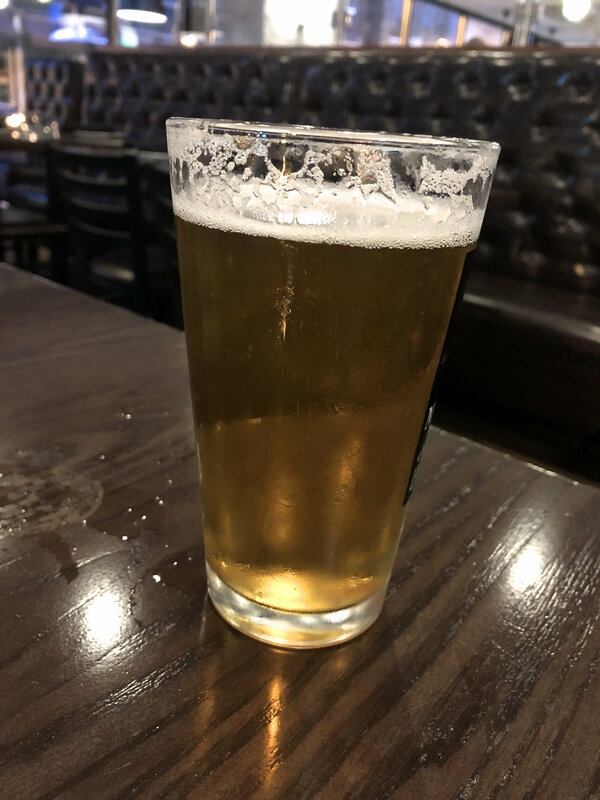 Seconds later, mixed in with the other 15 nectars of the go juice gods, I spied the Star Spangled Winner, Philadelphia Pale Ale, a 4.6% ABV that is 'citrusy and refreshing' and brewed with Pilsner malt and American hops. Hey PPA, I found out about you! Gin Blossoms reference. Anyone? Never mind. I see a lot of you shaking your heads now, not believing that I would not go big and select the 10.8% Imperial Russian Stout. Marty, did you leave your man card at home? Bro, does Jennifer keep ‘em in a drawer by the night stand? Did I forget to mention that it was a Tuesday? Sometimes you wanna just drink for the flavor...;)~. Let's continue. For several reasons, this first pale ale punch was satisfying. Yes, it was cold, slightly citrusy and very drinkable with a soft malt flavoring but just as important, it reminded me of my last visit to the small Irish bar where I had the feeling that I was part of the fabric of the neighborhood. Somewhere nearby I could have played whiffle ball in the street. 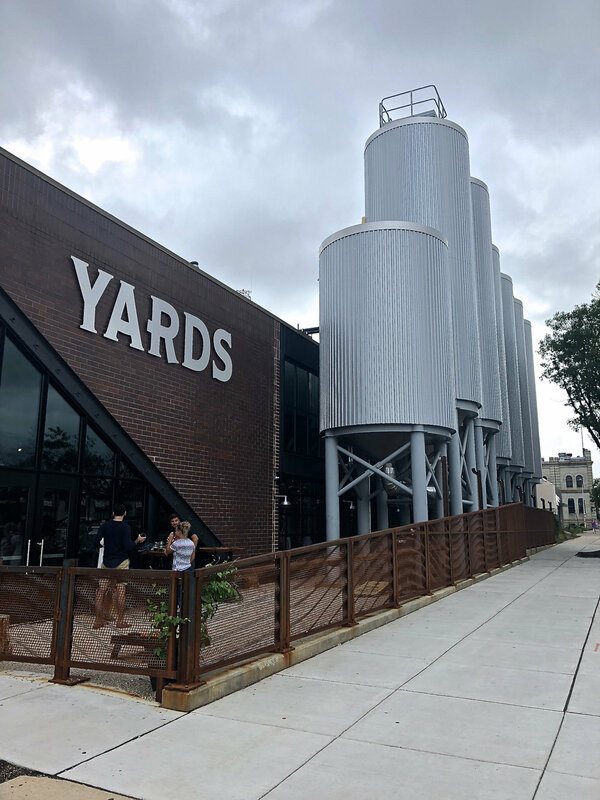 Yards Brewery, established in 1994, is local to the Philly area and doesn't have a huge presence outside the state (I couldn't find it at Total Wine after my last adventure here). Ben Franklin once said, "Well done is better than well said". I'd have to agree here. I could pound a couple of more of these but decide to take a deeper track on my next selection. Coffee Love Stout was applied for and, soon after, was asked which version I would like. Seems they have a Love Stout, a 'rich and seductive' Nitro Stout, and the Coffee Love Stout, the Love Stout aged on coffee beans. This particular puss wrinkler really had a background coffee palate but was right down the middle with most of the stouts I have had in my professional beverage career. Very good, it's 5.5% was lower than most stout ABVs but don' t think for a second that that (ok to use the word twice) knocked it down a notch. Sipping through the thin, creamy head, I felt that this was a great fall beer perfectly matched with football, a winner just like my Vikings! This is a safe zone beer designed for everyone, even those new to the world of stouts. Noticing that I either just had a small stroke or they just dimmed the lights, I sensed the place starting to fill up and I could now smell the delicious dinner menu. I was off to the races. It's time to step it up a notch as I have to properly prepared the gullet. Having done my recon early, I ventured into the deeper waters, swimming with Our Signature IPA, an American style 7.0% ambrosia introduced in 1998, designed to make you know what a typical India Pale Ale should taste like by kicking up the IBUs to 62. Sidebar II- speaking of Ambrosia, they are "an American rock band formed in southern California in 1970. Ambrosia had five Top 40 hit singles on Warner Bros Records released between 1975 and 1980, including the Top 5 hits "How Much I Feel" and "Biggest Part of Me". Most of the original band members have been active with the group continuously for the past 25 years to the present day". Snap back to reality...Taking a huge gulp (see photo below) to really let the liquid wash over the buds, this taste torpedo is loaded with malt flavor but indoctrinated with a hint of fruit and resin (actually a lot of resin). I really enjoy this mug-o-malice and would definitely recommend it to my hop head aficionados, even those of the Left Coast who may feel that West Coast IPAs are the only way to fly. In addition, the copper coloring and robust taste makes it a perfect beer for many foods, including some sharp-tasting cheeses. Hey, you gonna eat that? Feeling my equilibrium starting to shift, and given the fact that it's almost dinner time, I start tossing the digits in the communicator to take me to enjoy some more of the Cradle of Liberty's finest fare. Anytime you may be traveling to eastern PA, you have to stop in Philly. Unbelievable eats anywhere you go and enough ale houses to keep even the most finicky of drinkers satisfied. Yards Brewing Company should be a stop on the tour as it’s a great atmosphere, some good food and some even greater sauce. Many of our country's forefathers hail from Philadelphia. William Penn, an English nobleman, writer, early Quaker, under whose direction the city of Philadelphia was planned and developed, once said, "Knowledge is the treasure of a wise man". Ben Franklin, a Founding Father of the United States, was a leading author, printer, political theorist, politician, freemason, postmaster, scientist, inventor, humorist, civic activist, statesman, and diplomat. He was quoted as saying, ‘An investment in knowledge always pays the best interest’. Consider yourself educated and wealthy. And this professor say’s 'drink responsibly'!